Visualize how your company shares content and engagement! Weeeeeeeellllllll we tried integrate with the leap motion......After 16 hours we pivoted and decided to make a web app with data visualization because we like pretty colors. The problem: News outlets don't have an easy and visually pleasing way to measure the activity of their users through social networks. 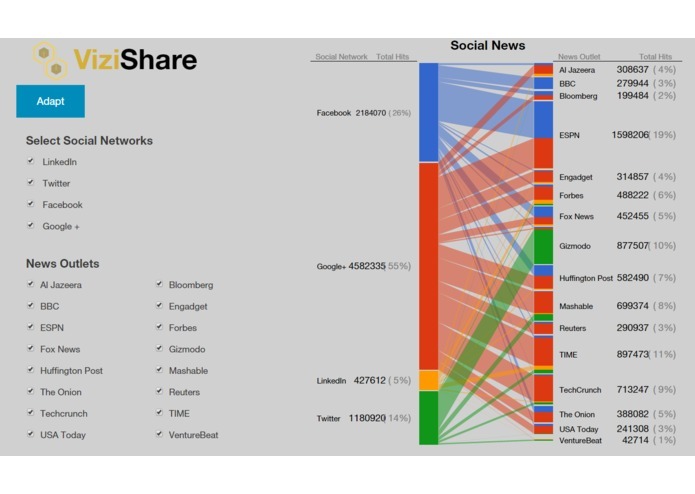 The Solution: Using ShareCount API (ShareThis was broken) to quantify the amount of shares of our chosen news outlets received in the top 4 social networks we were able to visualize the activity of different competing companies. The Result: The ability to see the strengths and weaknesses of different companies in different social networks. This tool would give companies the ability to easily see the marketing strategy and target audience of their competitors in real time. By having the ability to click on or off specific news outlets clear connections can be found between target audience engagement and the branding of a specific company ie Forbes, a serious company, has majority of its shares coming from LinkedIn and little arising from Twitter. Go To Market: Start by serving news outlets and giving them advice on how they can manage their precious marketing budget to attain the lowest cost of acquisition. Then branch out into different enterprise sectors like movies, gaming, sports events, and shares through e-commerce sites. This would be done while incorporating more sophisticated api and other sharing software; eventually leading to full reports actually analyzing why specific trends arise.